The rain falls from the sky, flows through our downspouts, and in most cases, it’s directed towards a storm drain. Thousands of gallons of water flow right past our properties every year. Meanwhile we are completely missing out on all of the ways we could be using it to help conserve potable water supplies. You may be thinking …” but it doesn’t rain that much, is rainwater harvesting even feasible in SLO County?” The answer is most definitely yes. You’d be surprised at the amount of water you can save. In fact, even if you collect rain off of a small 1,000 square foot roof, you’ll get around 600 gallons of water for every inch it rains! That can add up to a lot of extra water each year. Rainwater harvesting is already very common in many parts of the world and it’s quickly gaining popularity in California. That’s good news, because in our dry state it’s critical that we use our water resources wisely so that our communities can become more sustainable. This can be as simple as sticking a rain barrel under a downspout and attaching a hose to it or it can include a more advanced system that hooks right into your drip irrigation. Either way, the idea is that you can catch the rain that flows through your downspouts in a holding tank of some sort and then water your plants with it. This is what we call an Active Rainwater Catchment System. Since the rain barrel method is pretty simple and self-explanatory, let’s focus on a more advanced system. There’s the pre-catchment section, which includes the roof, gutters, downspouts, and typically some sort of pre-filter to get out large debris, bird droppings, or pollutants that have accumulated on your roof. Next you have your catchment tank. This can range anywhere from 50 to thousands of gallons in holding capacity. You’ll need to decide what size will work best for you. You must consider how much water the landscape needs and how much space you have available for a holding tank. In most neighborhoods, space will be a limiting factor. If you need more water than you have room for you have a few options. You can use multiple smaller tanks at different downspouts, you can build the system to use rainwater when it’s available and then switch over to potable city water when your tank is empty, or there are services that will affordably refill your tank with reclaimed water whenever it is getting low. Along with the tank, you’ll need a pump. The pump will allow the water to enter the irrigation lines at the proper pressure. There are many pumps to choose from with different features and price points, so do your research to find the one that’s right for your system. The last part of your active rainwater harvesting system will be what comes after the catchment tank. In this case, it’s the irrigation system. This will include your valves, irrigation lines, and emitters. Essentially, from the tank on everything is the same as it is in a conventional irrigation system. The exception to this would be if you need to use city water in conjunction with the rainwater. In that case you would need to have an extra valve, a backflow prevention device, and anything else that’s needed to allow the system to work and conform to local codes. That’s about it, these systems can range from very simple to quite complicated depending on your needs and budget. The catchment tanks come in all shapes and sizes so there are plenty of ways to customize it for your situation. These active systems are a great way to save a ton of water when it comes to irrigating your landscape plants. What if you don’t have room or you don’t want to use a catchment tank to harvest rainwater? Well, you have another option…We talked about Active Rainwater Catchment above, now let’s talk about Passive Rainwater Catchment. In a passive system, you redirect your downspouts towards a swale in the landscape. A swale is simply a low spot, or basin in the earth. 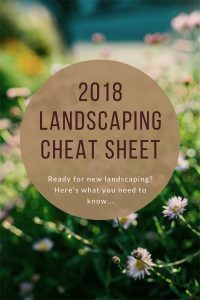 This can be in the form of a dry creek bed, a wide, shallow basin, or you can even fill the swale with an extra thick layer of mulch, making it so the ground looks flat. The rainwater will now flow into the swale and percolate into the soil. Assuming you have good healthy soil and a thick layer of mulch, that rainwater will be held in the ground allowing your plants to flourish from the extra moisture during the rainy season. Depending on the roof area that you are collecting the rain off of, this can have a dramatic impact on the health of your plants. Many plants rely on heavy rain fall in the winter to get them through the dry season. The effects of the extra water will be obvious even in the dead of summer, when your plants are still thriving even if you are irrigating infrequently. As an added bonus, the catchment basin itself can add a lot of interest to your landscape. 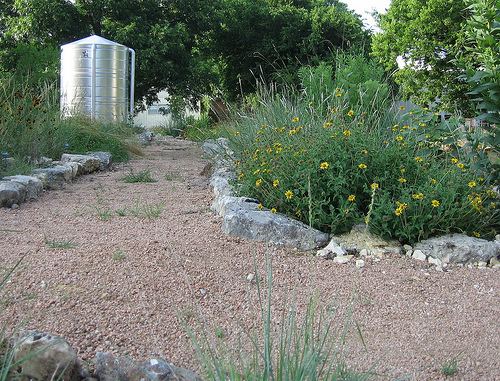 A dry creek bed, for instance, is a lovely focal point that gives the space a sense of natural beauty. Allowing the rainwater to infiltrate into the soil in this way is also great for the health of our environment. It allows the precipitation to infiltrate back down into our groundwater basins while filtering out the pollutants that have accumulated on your roof. This keeps our creeks and oceans cleaner and helps to recharge our falling groundwater levels. Besides using the rainwater in your landscape, there are other things you can do with it. Do you like to keep your car looking clean but don’t want to feel guilty for spraying it down with drinking water? Simply hook up a hose to a catchment tank and you can have a shiny clean car and an even cleaner conscience. Another way to use it is for watering your vegetable garden. Your plants will love it and just think about all the water you’ll be saving. One important thing to note about watering edible plants is that you have to be aware of how clean the rainwater is. Did it flow off of an asphalt shingle roof? Did your neighbor spray a bunch of herbicides on a windy day and some of it got on your roof? Are there any other substances that the rainwater came in contact with that could be harmful? Since you’ll be eating these veggies, you want to make sure there is nothing that could pass through from the rainwater and harm your health. Although this is mainly an issue with root vegetables, you’ll want to be careful to examine your catchment system to mitigate the risk. A good pre filter can help give you some peace of mind. There are many other ways to use the rainwater. Everything from washing pets to cleaning off the patio. Think about how you use water outdoors and you can start to get some more ideas. You can even use it indoors if you want. By filtering and purifying the rainwater, you can turn it into potable water that comes right out of your faucets! Around the world, people have found rainwater to be a valuable resource for their home. In SLO County, it’s a fantastic way to cut your water bill, conserve potable water, and utilize the rain that would typically flow right to the storm drains. If you need any more information about rainwater harvesting for your home, please feel free to give us a call and we’d be glad to help.